Evaluation is embedded into the heart of every project we undertake but inevitably the methods we use to evaluate vary from project to project. At the end of every piece of work we undertake a structured, internal review of our own processes and try to identify areas that worked well and areas that could be improved in the future. In addition, staff from the partnership organisation we have been working with, (prison staff, probation officers, YOT workers, conference organisers etc) are invited to provide written feedback on both the quality and effectiveness of the project and any other areas of relevance. These comments are fed into the overall review of the project. Any project which involves the direct participation of our core client groups is also evaluated by the participants themselves. We use a range of self-assessment tools which invite participants to reflect on their experience of being involved in the project. Participants might be asked their opinions about what difference participation has made to their thinking, the way they feel about themselves, what they will take away from the experience, and how they found the style of project delivery. For some projects, in addition to the evaluation methods above, we will also employ psychologists or independent researchers in order to provide a more scientific, quantifiable data with regards to the efficacy of our work. These academic studies are generally published in peer reviewed journals and most are published on the National Alliance for Arts in Criminal Justice Evidence Library. 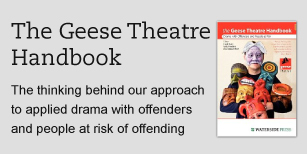 They are able to engage with offenders in a creative and imaginative way, using drama to recreate experiences and teach new ways of behaving. In this way, they encourage responsibility and enable offenders to experience and understand the consequences of their actions.